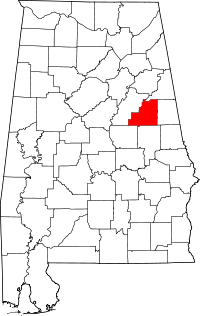 Clay County was created on December 26, 1866 from land taken from Randolph and Talladega Counties. Clay County is located in the east-central part of the state, in the foothills of the Appalachian Mountains. The Talladega National Forest is located in the western part of the county. Named after the statesman Henry Clay, the county seat was named after his hometown of Ashland, Kentucky. Clay County was formed as the citizens had a difficult time reaching the county seats of Wedowee in Randolph County because of the river to the east and Talladega was difficult to reach because of the intervening mountains. Other communities include Lineville and Mellow Valley.